Felicity continues her odd alliance with Black Siren, who tries to use the power of the District Attorney to get Oliver Queen a new trial. Meanwhile, a guard at Slabside is murdered and everyone is a suspect, but the focus of the official investigation falls on Oliver Queen's one friend in prison, Stanley. Black Siren says that the FBI failed to keep their end of Oliver Queen's plea-bargain since Ricardo Diaz is still at liberty. It was pointed out repeatedly by Agent Samandra Watson that Oliver's surrender was contingent on the FBI bringing down Diaz's empire - not capturing Diaz himself. Apart from that, Black Siren's plan is just idiotic and seems to confuse an appeal with a dismissal. She asks for Oliver's conviction to be overturned for reasons that have nothing to do with his original trial and the fact that he helped to expose corruption inside the prison he was being held in and was beaten for his trouble, while troubling, has no relevance to whether or not he was guilty of the crimes for which he was convicted or whether he made a plea-bargain in bad faith. Additional: Everyone seems to have forgotten that Laurel Lance was once Oliver Queen's long-term girlfriend and Black Canary before her apparent death. Both of those should have been reason enough for a judge to deny "Laurel" the right to represent Oliver Queen in court, due to the massive conflict of interest. 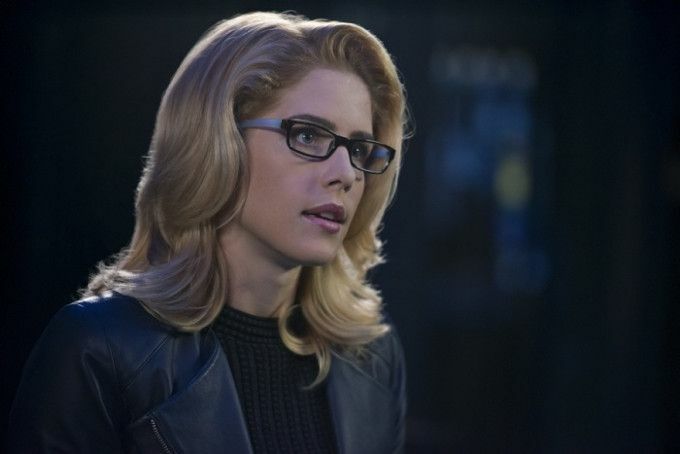 Emily Bett Rickards continues to slay as she showcases Felicity's sliding down the slippery slope of idealism. The action sequences with the silenced sound and muffled effects continue to impress. In fact, the whole of the fifth-segment action sequence is well blocked and well directed. This episode introduces a former KGB associate of Anatoly's named Pytor Roslov. This was also the name of the head of the KGB in the graphic novel Superman: Red Son, who was that world's equivalent of Pete Ross - Clark Kent's best friend growing up on Earth Prime. There is a color variation on the hologram map of The Glades Felicity sent William. He thinks that is where she wanted them to go. Felicity uses a Cyrillic dictionary to attack the table of hashed password to hack Roslov's computers. BETAB-500 is a top of the line aerial explosive that can cut through concrete like it was nothing. Diaz buys two of them. It is later revealed that this particular model of the BETAB-500 is a newer model that can be attached to a pipe, like a gas line. The bombs are wired together in such a way that they must be deactivated simultaneously. Otherwise, the other bomb is triggered. Each linking device is protected by its own cryptokey. Oliver: Felicity would have told me if she was working with you. And the only reason that you would ever help me - or anyone - is if there was something in it for you. Black Siren: That's not true! Oliver: Yes, it is. You're the reason that Diaz got away in the first place. Do you remember? Black Siren: (bitterly) You know the Ollie that I knew? He had a hard time taking responsibility for his failures too. Oliver: You know what's amazing? (pauses) You are nothing like her. So go ahead and pretend to be Laurel. My Laurel. For as long as you want. You never will be. Ever. (pauses) Stay away from my wife. Black Siren: We planted a tracker on The Silencer's belt. Obviously Diaz must have found it and was using it as bait against us. Dinah: (To Felicity) How did you manage that? You were nowhere near The Silencer at The CDC! Curtis: That thing at the CDC was you guys?! Rene: Uh - Felicity wasn't near her. I was. We snuck her out together. Dinah: So you two captured The Silencer?! Rene: But Felicity and Laurel were the ones that tortured her. Black Siren: Actually, I convinced her not to. You're welcome. Diggle: (To Felicity) So now you're working with Laurel? Black Siren: I'm standing right here! Dinah: To be fair, she did help shut down that illegal psychiatric program at Slabside. Rene: (To Dinah) Wait. Hold on a second. You're gonna give me crap about working with the new Green Arrow and meanwhile you're siding with the Black Frickin' Siren?! Black Siren: Again. Still here. Felicity (To Rene): You're working with the new Green Arrow?! Curtis: Guys! I think that the whole point of this is that maybe we could pick up our phones a little more, huh? Shoot a text. (suddenly annoyed) Yeah. I am totally talking about the fact that everyone forgot my birthday last week! Felicity: (having lost all patience) Your party is next week! Act surprised! Okay. Now that all of our deep, dark secrets are out, do you think we could switch our focus back to the psycho who just tried to blow us up?! Anatoly: (having been sitting quietly watching this argument unfold) Sounds like good idea. Felicity: I think it's really hard to travel when you're on Homeland Security's Most Wanted List. Anatoly: You are threatening me? Felicity: Call it an enthusiastic suggestion. Felicity: I am willing to do whatever it takes to end this! Diggle: But then what? Felicity, I've known you for a long time and you are a good person. But I've been to the front-lines and I know exactly what that does to people. I just hope that when this war is over... you still come out a hero. Anatoly: Regret. Guilt. These are demons you choose to live with. A trade you make to get what you want. How bad do you want to kill Ricardo Diaz? Anatoly: Well then you embrace demons. No more half measures. When I work with Oliver in Russia - he was not villain. But he did what needed to be done. You remind me of him then. Felicity: What would that Oliver have done in this situation? Anatoly: He would have ended Diaz. And he wouldn't care about the cost. Dinah: (To Black Siren) Did you even bother to listen to yourself in court? You spoke from your heart. Big surprise, by the way - you do have one. Oliver: Must be difficult to win a case when you're not a real lawyer. Anatoly: What, because I am Russian? That is stereotype! Anatoly: But, da. Yes. Vodka. I only have a bit left. Black Siren: I don't want your thanks. I didn't do this for you. I did this for me. And no, I am not your Laurel. I'm not the old Laurel. I'm me! Everyone has good and bad inside of them and you can't put people in one box or the other. Ever. Diaz tortures Anatoly, saying he isn't killing him until he uses him to destroy Oliver Queen. Level 1 has new guards that conduct cell-checks every half hour. The inmates also get less yard time. Stanley hasn't suffered too much, apart from Brick having it out for him since he was the only one Brick could get to after Oliver shut down Brick's fight club in 703. Dunbar, the guard in Brick's employ, got a slap on the wrist for his part in running the fight club. Still, he has turned on Brick and started harassing him. The entire Bratva was apparently killed, according to chatter on the dark web. Diaz sets up a trap using The Silencer's belt and Felicity's tracker to try and take out Team Arrow, ARGUS and Dinah's SCPD team. Officer Dunbar is killed and Stanley is blamed and sent to The Hole. Pytor Roslov is a former KGB agent with ties to the Russian military and a former associate of Anatoly's. Anatoly says that Diaz contacted him about a weapon capable of destroying a city. Anatoly agrees to help get information on what Diaz bought in exchange for safe passage to The Maldives. Oliver finds the knife used to kill Dunbar hidden behind a loose tile in the prison shower. Dinah goes to watch Black Siren's petition hearing. The federal judge denies Black Siren's petition to appeal Oliver's case, though she does agree there needs to be an investigation of Slabside's treatment of its prisoners. Bronze Tiger's prints are found on the knife that killed Dunbar. He is thrown in The Hole, while proclaiming his innocence. Dinah says that she didn't believe Black Siren's talk of changing until she heard hear speak about how hard it is to be a hero when nobody expects you to be one. Dinah stops Black Siren from killing the judge who ruled against Ollie. Felicity determines that Diaz is planning on using a gas plant to set all of Star City on fire by blowing up the gas lines and setting them on fire with the BETAB-500s. The new Green Arrow joins the fight against Diaz at the gas plant, stopping him from triggering the bomb and knocking him out. The Longbow Hunters escape, but Diaz is captured. Black Siren tells Oliver that the appeal failed but that the judge ordered an investigation of Slabside. Felicity makes good on her promise and gets Anatoly a fake passport with the name Jason Brown. Anatoly gives Felicity his gun and advises her not to look back now that she's captured a dragon. Felicity almost kills Diaz but is stopped by Black Siren. Black Siren tells Felicity that she made a deal with The Feds - if Oliver agrees to help them with their case against Diaz, he can go free. Stanley is released back into general population. Oliver asks Stanley how he knew the weapon that killed Officer Dunbar was Bronze Tiger's knife when he was in The Hole when word got out that Dunbar was stabbed to death. This indicates that Stanley was the real killer. Felicity was murdered several weeks before William went to Lian Yu. Felicity became a vigilante and started calling herself The Calculator. She cut ties from the rest of Star City's heroes. Dinah says that she was running in dangerous circles. William and Zoe apparently knew each other pretty well before William left Star City. He calls her the girl who loves getting into trouble. She calls him the boy who has to know everything. Roy says that the message he found in Oliver's bow in 702 that convinced him to come to Star City was something called The Mark of Four. Roy says that he and Dinah should keep the Mark of Four secret from the rest of the team. Dinah says nobody has seen William Clayton in years and they have no reason to trust him. Unlike Roy, Dinah doesn't think the fact that he is Oliver's son makes William trustworthy. Felicity has a lock on her hideout that requires three bouncing balls be shot with arrows to deactivate the security system. This is a nod to how Oliver used to train in the Pilot episode. The last file Felicity accessed were structural maps of key buildings in Star City, including city hall, the central library and the old Rockets arena. There are also semantics for explosives and the money to build them. This would result in destroying all of Star City that is not The Glades. It is unclear if Felicity was part of the plan to blow up Star City and got cold feet or if she was trying to stop the plan and summoned help when she got in too deep. Feliicty's last call was to someone called Blackstar. Diaz is said to have killed all the Bratva off-camera. A solid episode, that finally gets Team Arrow on the same page and shows what happens when our heroes actually work together and stop keeping secrets from one another. It has a few flaws, particularly in how it handles an appeal trial, but I'm willing to forgive this given the whole thing subtly shows what a crappy lawyer Black Siren is and how she has no interest in redemption or being a hero. Much as I loathe the character, I find her embracing her wickedness far more palatable than the wishy-washy "will-she-or-won't-she" redemption arc from last year. Strangely enough, the flash-forwards this time fall kind of flat, with no real new information being revealed and a lot of mysteries (like this Mark of The Four) that don't give enough clues for the viewer to guess at their meaning. Still, not bad at all.